Happy 2 year Gotcha Day Anniversary Autumn. We love you and are so happy you are our daughter. You are completely crazy, a total wild woman and you bring a million smiles to our faces everyday. 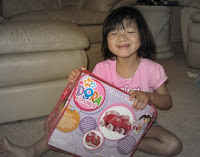 It's been amazing to watch you grow from the little girl you were 2 years ago into the 4yr old tom-boy you are today. We brought home McDonald's happy meals for lunch this week. 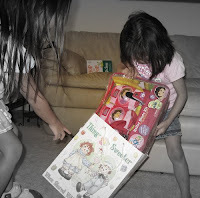 The happy meal boxes were decorated with Disney's Pirates and Princess theme. I began to tell you and Kya about the event at Disney and explained we could go if you wanted and you could dress up like princesses, you declared "I no Princess. I a Pirate. Rrrrrrrr." And you are my dear...you love Pirates, Cars, Thomas the Train, Spiderman, dragons and all things busy, active and lively. 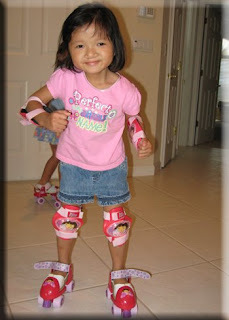 At 7am one morning I heard this loud noise, you had come zooming out of your room in your nightgown and roller skates...you were already up and skating through the house. 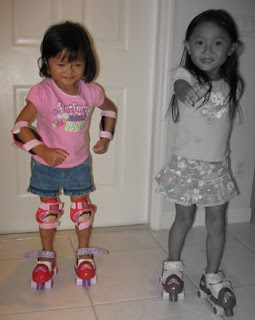 You and Kya had been sharing a pair of skates and so for your Gotcha Day Anniversary this year, you received your very own pair of skates, which you were thrilled about! You are full of life, full of joy and we love you!